Roasted beets - simple yet delicious. 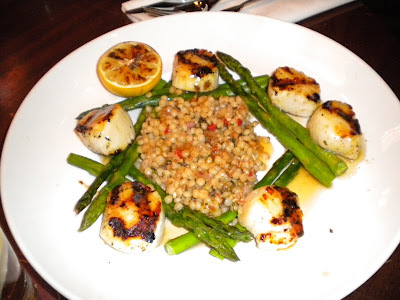 Back in December, I met up with several ladies at Repast to catch up with a friend who was visiting from out of town. 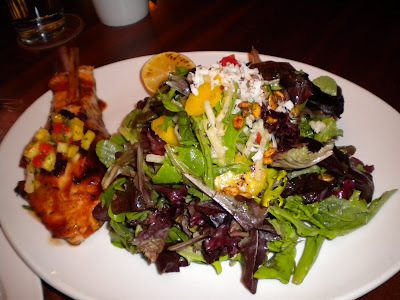 It was early and I was not that hungry, so I tried the roasted beet salad, above, which was a good choice for a light appetizer. 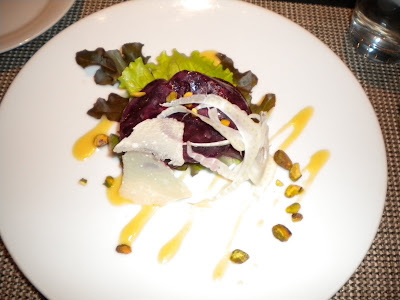 Shaved fennel, parmigiano and pistachios worked in combination to render a delightful flavor. 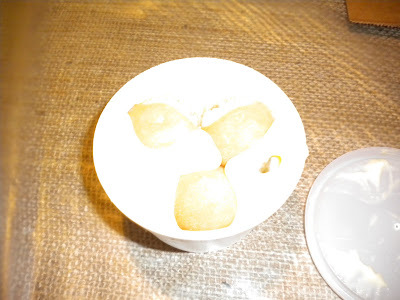 I tasted the winter soup (photo below), which was also very good. Although the place was just about empty when we arrived (around 5:30 on a cold Wednesday) our food took quite a long time to prepare - so long in fact that we had to ask about how much longer it would be as our out of town visitor was due at the airport. Fortunately the food did come in time, although she was forced to wolf it down. In retrospect we should have alerted the waitstaff of her need to eat fairly quickly beforehand. I'd like to come back here to have a full dinner sometime. 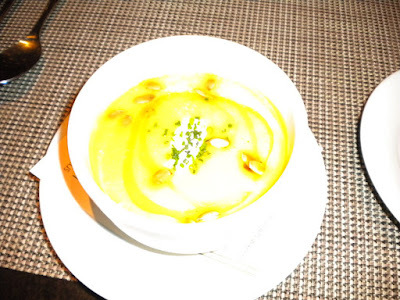 Kabocha & butternut squash soup - very creamy. 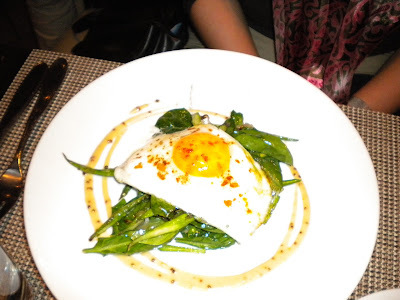 Warm asparagus and wild mushroom salad with sunnyside farm egg. 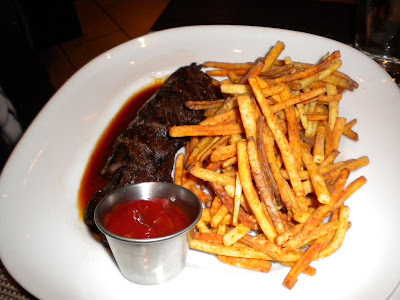 Grilled hangar steak with root vegetable fries. 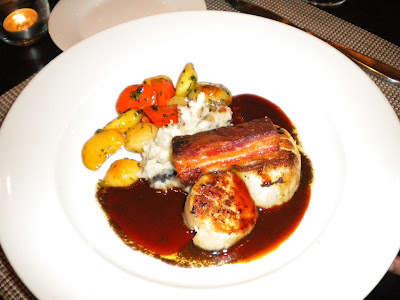 Seared sea scallops and pork belly. 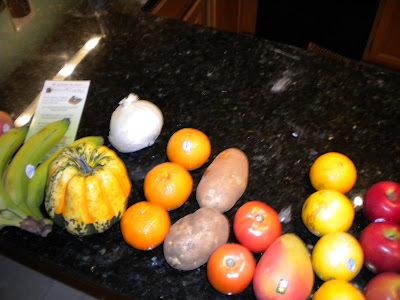 I was recently offered a free "tiny" box of produce from Nature's Garden Delivered, a company that delivers organic fruits and vegetables. The box was actually quite a generous portion and I like that you can go on the website and select what you want. They also offer small, medium and large boxes. This is a neat service for those who want organic produce and either don't have time to shop for it themselves or cannot get out of their home easily. 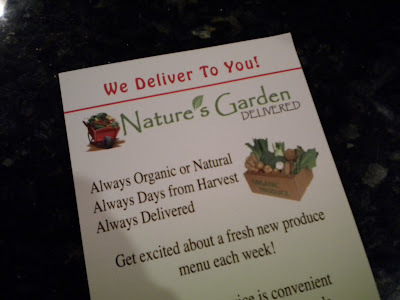 Sample of the Tiny box from Nature's Garden Delivered. 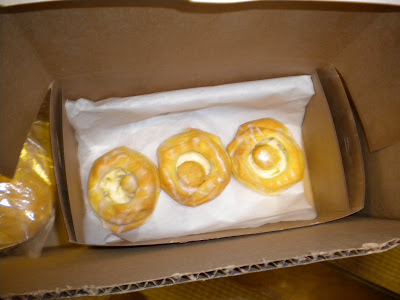 Several weeks ago I was offered a complimentary box of breads from The Grateful Bread Company in Smyrna, which supplies wholesale breads and sweets to area restaurants. 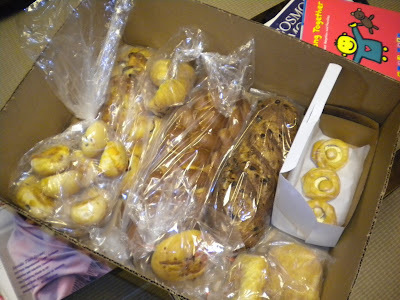 In addition to what is photographed specifically, the box included mini-chocolate croissants, foccacia kaiser rolls, ciabatta squares, jalepeno rolls and a large foccacia bread. The jalepeno rolls and the challah (pictured below) were my favorites. I made some delicious French toast with the challah and enjoyed sharing all the breads with my family during the holidays. 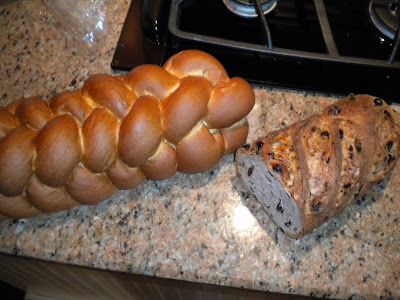 Challah and walnut raisin torpedo (cut). 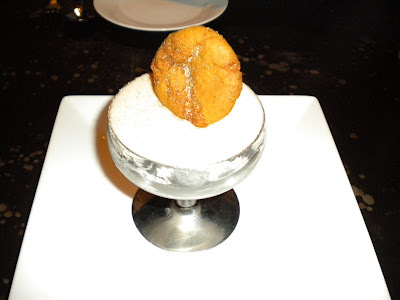 Fried stuffed olives and Proscuitto di Parma. Recently I took Calvin to a (very) belated birthday dinner at La Pietra Cucina, a true Italian restaurant that opened within the past two years in Midtown. It also happened to be a place I had wanted to try for months. I suppose I was just waiting on the right occasion. We were seated by the window, which was slightly cold; however, our server soon closed the curtains, which helped with the temperature. 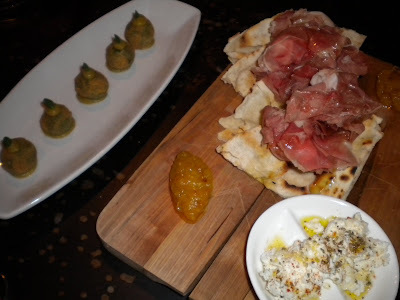 We started with the stuffed fried olives (very tasty) and the Proscuitto di Parma: flatbread and wonderful proscuitto with fresh-made ricotta and pineapple mostarda (photo above). In a word, excellent. Honestly I could make a lunch out of the flatbread and would love every minute of it! See below for further details on what we ate. For a special occasion restaurant, I recommend this place wholeheartedly. It's also nice that they offer lunch; this creates an occasion to try some of the lighter dishes and end up with a lower price point. 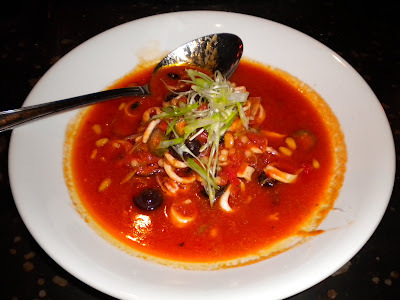 Calamari in Sicilian tomato zupetta - perhaps the most delicious part of the meal. This is enough for a light lunch entree (with the bread). 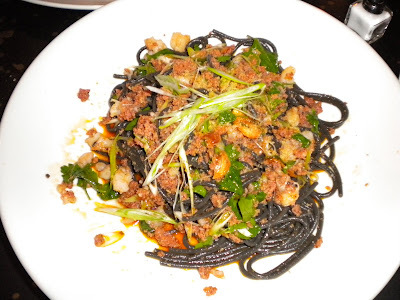 Black spaghetti with rock shrimp, scallions and calabrese sausage - quite spicy and salty with a unique taste. Next time I'd like to try one of the pastas made in-house. 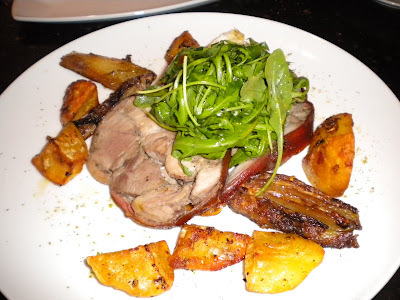 Porchetta - special of the day. This was a bit heavy, especially with the potatoes, but the meat was very flavorful. Gelato with a cookie - yum. 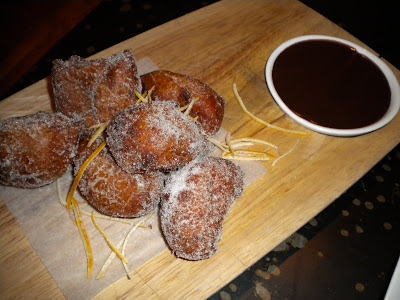 These light, delicious doughnuts with thick chocolate on the side were an absolutely outstanding finish to the meal. 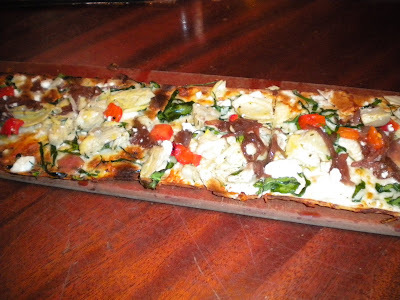 Goat cheese, onion and artichoke flatbread. Back in December I had lunch with some colleagues at Season's 52 - Perimeter. I'd heard good things about this restaurant, which has 2 Atlanta locations and about ten other locations, many in Florida. Every menu item is under 475 calories, which is nice to know, but even better, taste is not sacrificed for the health-conscious! 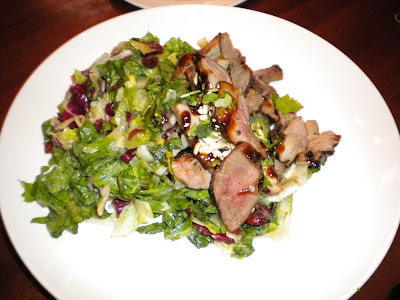 I really enjoyed the Maple Leaf Farms duck chop salad (below) as well as the flatbread (great for sharing) and dessert. My dining companions all seemed to enjoy their selections as well. The atmosphere is busy, yet subdued and the gas logs burning in the front of the restaurant add a nice touch. I'd love to come back and try dinner here. Prices are a bit on the high side, but everything was really delicious! Duck salad - pre-lift. 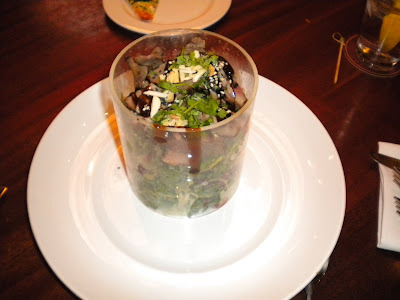 The salads were both brought this way - a neat presentation. 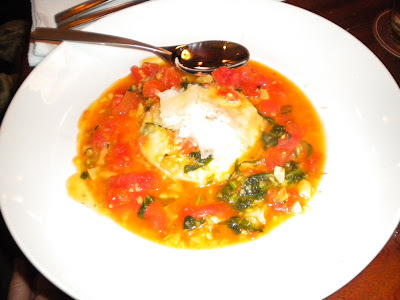 Housemade Sonoma goat cheese ravioli. 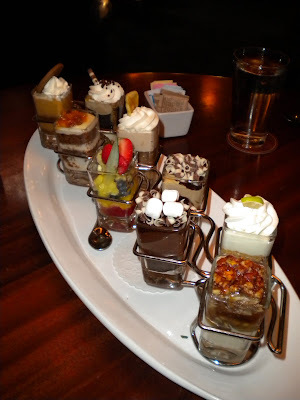 Mini-dessert choices. I tried the delicious key lime pie (2nd from bottom on right). 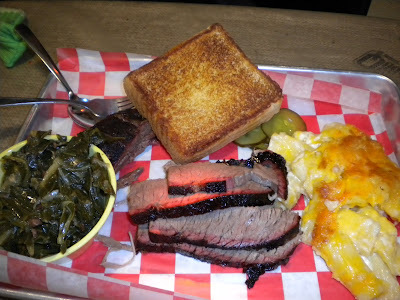 Chloe's rib combo platter with brisket, collards and mac and cheese. At the beginning of December I met up with Chow Down Atlanta's Chloe for lunch at Community Q BBQ on Clairmont Road in Decatur. Chloe's post, which you can see here, pretty much sums up our experience. 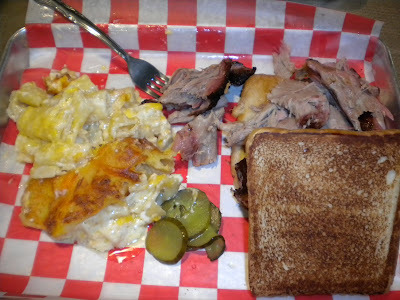 I also liked the food, especially the large chunks of pulled pork and the sinfully creamy mac and cheese; and I agreed that the greens were too salty. Calvin and I returned later in December and the collard greens' saltiness had been lessened - a real improvement. On my second visit I also tried the Brunswick stew, which was decent but not great as the flavors were too mild and without enough punch. Still, I am very happy to have a BBQ joint in this location and I rank it up there in my top three with Fox Brothers and Daddy D'z. What is your favorite Atlanta BBQ restaurant? Pulled pork sandwich with mac and cheese.